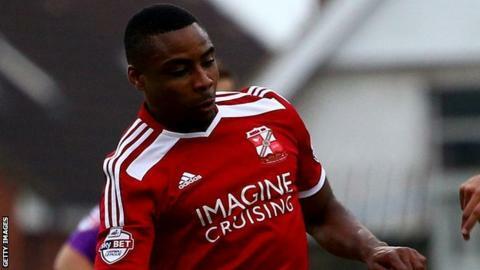 Goals from Andy Williams and Jonathan Obika saw Swindon defeat Peterborough and move to within one point of League One leaders Bristol City. Williams fired the visitors ahead with a low finish off the inside of a post. The Robins doubled their advantage two minutes after the restart, as one-time Posh loanee Obika dived to head in a Ben Gladwin free-kick. Posh hit the bar late on but Joe Newell did halve the deficit with a fine 20-yard strike in stoppage time. "First half (we were) very good, second half very poor. Once we got the second goal we tried to see the game out instead of playing properly. "You have to be professional, we didn't do that. "We dominated the game (in the first half), we passed the ball really well, created numerous chances. "That's given us food for thought." Match ends, Peterborough United 1, Swindon Town 2. Second Half ends, Peterborough United 1, Swindon Town 2. Attempt missed. Jermaine Anderson (Peterborough United) right footed shot from the centre of the box is too high. Goal! Peterborough United 1, Swindon Town 2. Joe Newell (Peterborough United) left footed shot from outside the box to the bottom right corner following a set piece situation. Foul by Jonathan Obika (Swindon Town). Ricardo Santos (Peterborough United) wins a free kick on the left wing. Nathan Thompson (Swindon Town) wins a free kick in the attacking half. Foul by Joe Newell (Peterborough United). Attempt blocked. Nathan Byrne (Swindon Town) right footed shot from the right side of the box is blocked. Foul by Massimo Luongo (Swindon Town). Conor Washington (Peterborough United) wins a free kick in the defensive half. Substitution, Swindon Town. Amari'i Bell replaces Harry Toffolo. Corner, Peterborough United. Conceded by Massimo Luongo. Foul by Jordan Turnbull (Swindon Town). Conor Washington (Peterborough United) hits the bar with a right footed shot from the centre of the box. Attempt blocked. Michael Bostwick (Peterborough United) header from the centre of the box is blocked. Corner, Peterborough United. Conceded by Nathan Byrne. Foul by Nathan Byrne (Swindon Town). Kgosi Ntlhe (Peterborough United) wins a free kick in the defensive half. Attempt missed. Jack Stephens (Swindon Town) right footed shot from outside the box is close, but misses to the left following a set piece situation. Jack Stephens (Swindon Town) wins a free kick in the attacking half. Foul by Aaron McLean (Peterborough United). Foul by Harry Toffolo (Swindon Town). Michael Smith (Peterborough United) wins a free kick on the left wing. Andy Williams (Swindon Town) wins a free kick in the attacking half. Foul by Ricardo Santos (Peterborough United). Attempt missed. Aaron McLean (Peterborough United) right footed shot from a difficult angle on the right misses to the right. Attempt missed. Luke James (Peterborough United) right footed shot from outside the box is too high. Attempt saved. Nathan Byrne (Swindon Town) right footed shot from outside the box is saved in the centre of the goal. Substitution, Peterborough United. Conor Washington replaces Kyle Vassell. Substitution, Peterborough United. Luke James replaces Nathaniel Mendez-Laing. Jordan Turnbull (Swindon Town) wins a free kick in the defensive half. Foul by Michael Bostwick (Peterborough United). Attempt blocked. Michael Bostwick (Peterborough United) right footed shot from outside the box is blocked. Hand ball by Jordan Turnbull (Swindon Town). Corner, Peterborough United. Conceded by Jordan Turnbull. Substitution, Swindon Town. Yaser Kasim replaces Louis Thompson.